Check out past retreats by selecting the heading from the drop-down menu! Kim Robertson is a renowned performer, arranger and recording artist who has stretched the boundaries of the harp for a new generation of performers and audiences. As a pioneer in the American folk harp movement, she combines an improvisational spirit with a passionate sense of tradition, bringing a contemporary touch to a centuries-old instrument. Born in Wisconsin, she is classically trained on piano and orchestral harp. In the mid-70's, Kim's discovery of the Celtic harp grew into a profound love for the instrument, setting her upon the path of exploration for which she is now widely known. 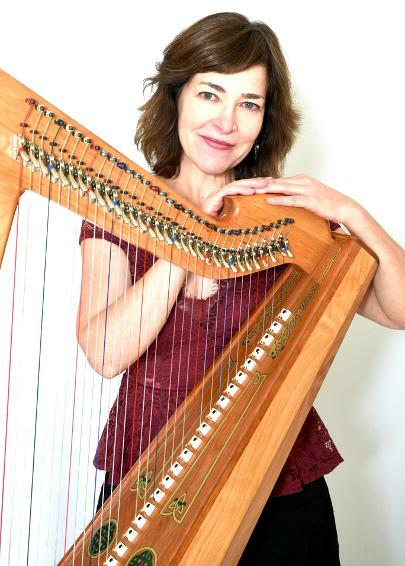 Kim has traveled with her harp from concert halls to grass roots folk clubs, from luxury cruise ships to remote mountain tops; she has performed concerts by candlelight, delivered singing telegrams and played herself on an episode of "Beverly Hills 90210". She regularly tours the USA, Canada and Europe, and is still recognized as one of the most popular folk harpists performing today. Her work encompasses numerous recording projects, published harp arrangements, and an international itinerary of workshops and retreats. We've even made the schedule into a handy-dandy PDF that you can download and print below. Keep checking back! Registration for the full weekend includes workshops, harp circles, Saturday lunch, and snacks. There will be an extra meal cost of $15 for any family members or guests eating the Saturday lunch. Download this form and mail it to the Big Sky Harp Society with your registration check. We look forward to having you join us! Registration fees do not include Friday or Saturday dinners – these will be on your own (with harp friends, of course). Remember to label your tuners and tuning keys with your name! Many look the same and it’s hard to know who they belong to by the end. We will be learning and playing together several songs during our retreat harp circles. Be sure to print out the lead sheets below and bring them with you so you can join in the fun! Alphabetize your music in your binder, that way you can find the piece quickly. Bring a pencil to make notes. Try playing the first chord of every line. We encourage you to print out all the lead sheets on the Harp Sheet Music Page, but the ones above will be "fair game" for our harp circles.